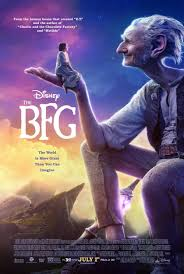 Review: A young orphaned girl name Sophie is taken away by a magical land by a big friendly giant. This is the second time that Steven Spielberg and Mark Rylance have teamed up together (the first being Bridge of Spies, 2015). Mark Rylance makes this film his own. This is exactly the right part for him. He captures the humanity and warmth of the BFG really well. Without Mark Rylance they couldn’t have done this film. The motion-capture works are brilliant. Lovely to see scenes of London as this is very rare. The script is written by the late Melissa Mathison who sadly passed away in 2015. The most famous film she has written the script for is E.T. (1982). At the end credits it has got a dedication that reads “FOR OUR MELISSA”. It is stated on IMDB that this theatrical feature film has been in development for almost twenty-five years. John Madden was originally down to direct but decided in the end to focus on The Second Best Exotic Marigold Hotel (2015) instead. This is Roald Dahl’s own favourite of all his stories. The day that this movie opened in cinemas was on June 30th, 2016, which marked the 100th anniversary of his birth. A film about friendship, loyalty and about protecting your friends. The ending scene in this at Buckingham Palace is a delight. Penelope Wilton goes from one Downton Set to the next! !